Severe types of adhesive wear are often called galling, scuffing, welding or smearing, although these terms are sometimes used loosely to describe other types of wear. In metal-to-metal wear tests, high stresses can result in catastrophic galling and eventual seizure even after a single cycle. High loads, poor lubrication, high temperatures, high sliding speeds may results in galling. In contrast to many other forms of wear, galling occurs spontaneously. Galling results in a catastrophic failure and accompanied by materials transfer and appears as a groove, or score mark, terminating in a mound of metal. Some applications where galling is encountered are roller chain belt pins, woven screening, hanger, end, and spherical bearings, and valve and pump components. Galling is a potential problem in all types of threaded assemblies including fasteners, turnbuckles, check valves, stems, inserts and electrical connectors. 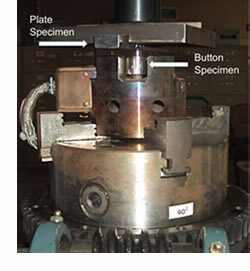 A button and block galling test was designed to characterize materials for galling. In this test, a small button specimen and a large block specimen are machined and polished to provide parallel contacting surfaces. The specimens are deadweight loaded in a Brinell hardness tester, and the button is rotated 360◦ against the block. Specimens are then examined for galling at 10× magnification, with new specimens being tested at progressively higher stress levels until galling just begins. This point is called the unlubricated threshold galling stress. Galling stress is a good measure of wear resistance of a given material pair. Galling data shows that identical metal couples usually do poorly in terms of galling compared with dissimilar metal couples. When stainless steels are coupled with each other, with the exception of some Nitronic steels, they exhibit worse galling resistance than all other steels by a factor of 2 or more. The Tendency for Galling to Occur can be Reduced by Using Dissimilar and Hard Materials of Low Ductility, Lubrication, and Rougher Surfaces. Galling is an adhesion phenomenon which tends to be exaggerated with materials that exhibit a high degree of plastic behavior. It tends to occur in situations involving high loads, large apparent areas of contact, and sliding. The use of hard and dissimilar materials and a lubricant tends to reduce adhesion under these conditions. The use of materials with low ductility and rougher surfaces generally reduce the effect of plasticity on galling behavior. 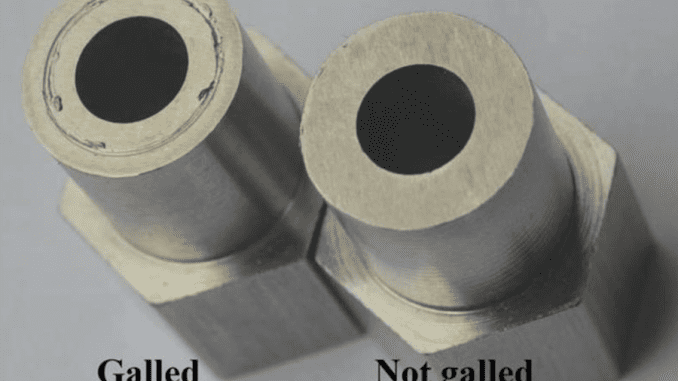 Both low ductility and higher roughness tend to inhibit the size of the galls that occur, which typically reduce the sensitivity of applications to the occurrence of galling. Thus when two smooth metal surfaces are brought into contact, asperities, or high points, and not the nominal areas are in contact. Under static loading, deformation of the asperities occurs until the real contact area increases to support the load. If relative motion is then introduced, adhesive wear or galling may occur in one or both of the following ways: (1) by shearing of interface oxides protective to the base metals followed by asperity contact and welding under pressure, with the weaker of the two metals yielding; (2) by the formation of a weld junction that is stronger than either of the base metals causing wear to take place in the bulk of both materials in sliding contact. There are several points to guide for preventing galling . Austenitic Cr-Ni stainless steels (e.g., AISI 303, 304, 316) have a tendency to gall and cold weld when in dry sliding contact. These are used where toughness and corrosion resistance are of primary concern and the material should be nonmagnetic. Austenitic Cr-Ni-Mn nitrogen strengthened stainless steels (e.g., Nitronic 32, 50, and 60 and AISI 201, 202) provide a combination of exceptional corrosion resistance, anti-galling characteristics and strength. Nitronic 50 steel provides the maximum corrosion resistance (Bhushan and Gupta, 1997). In these steels, the manganese enhances work-hardening characteristics, and the nitrogen is a solid solution-strengthened agent, acting like carbon. As a result, the galling and metal-tometal wear characteristics of austenitic Cr-Ni-Mn nitrogen-strengthened steels are superior to austenitic Cr-Ni steels. The martensitic stainless steels (e.g., AISI 403, 410, 416, 420, 440C, and 630, or 17-4 PH) and precipitation-hardenable semiaustenitic steels (e.g., AISI 631 or 17-7 PH) have high hardness and high abrasion resistance but low impact resistance. Ferritic steels (e.g., AISI 405, 430, 442, 446) fall some place in between austenitic Cr-Ni and martensitic steels as far as galling and wear resistance are concerned. Precipitation-hardenable martensitic stainless steels, such as AISI 440C, behave like tool steels. These are widely used for dies, cutting devices, and rolling-element bearings, and for instrument bearings where rusting from moist air will impair stringent performance requirements. Cobalt-based alloys such as T-400 and Stellite 6B have, in general, good galling resistance. However, several nickel-based alloys exhibit a very low threshold galling stress when self-mated or coupled with other similar alloys. A nickel-based alloy such as Waukesha 88 can be modified specifically for galling resistance. Waukesha 88 exhibits extremely high galling resistance in combination with several stainless steels. It should also be noted that a high nickel content in steels has a detrimental effect on galling resistance. When compared with steels, with the exception of 316 stainless steel, the remaining steels exhibit moderate threshold galling stress when coupled with the cobalt-based alloy Stellite 6B. Type 316 steel probably exhibits a low galling stress because it has a higher nickel content than type 304 stainless steel. Wear data show that among the various steels tested, types 201, 301, and hardened 440C and the proprietary Nitronic austenitic grades provide good wear resistance when mated to themselves under unlubricated conditions. High nickel alloys generally are rated as intermediate between the austenitic and martensitic stainless steels. Cobalt-based alloys also do well. Considerable improvement in wear resistance can be achieved when dissimilar metals are coupled, and this is especially true for steels coupled with silicon bronze and Stellite alloys. The wear data further suggest that improvement in wear resistance can be achieved by altering the surface characteristics, such as by surface treatmentor by adding a coating. The galling stress is given in MPa. The value of stress of 345 means that material up to 345MPa stress did not gall and further testing was not performed. Data is taken from . ASTM galling test method G 98.
. REVIEW OF THE WEAR AND GALLING CHARACTERISTICS OF STAINLESS STEELS, Committee of Stainless Steel Producers American Iron and Steel Institute.
. PRINCIPLES AND APPLICATIONS OF TRIBOLOGY, 2nd Edition, B. Bhushan, 2013.
. Nanoscale wear as a stress-assisted chemical reaction, Tevis D. B. Jacobs & Robert W. Carpick, Nature Nanotechnology volume 8, pages 108–112 (2013), DOI https://doi.org/10.1038/nnano.2012.255.